The onesie was a little small for Dexter (it is a 12-18 month) and I fear he will only be able to wear it for about a month. As you can tell by the sweet pictures, his little belly is hanging out!! 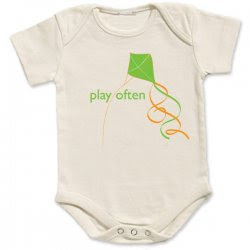 I love the mantra of Play Often. Its not like the Dman needs any permission to go and have fun but this onesie reminds me that he is just a sweet, innocent and eager little boy who loves to Play Often! The shirt is sooo soft and sweet. I loved the cream color. I especially love that it is 100% organic and I don't have to worry about harmful chemicals or dyes in the print. What are you waiting for? Go over to Tees for Change and buy yourself a tee and in return, a tree will be planted! !